So I did exactly what Nigella (yes, our relationship is so close now that we are on a first name basis) suggested- use what’s fresh and available! 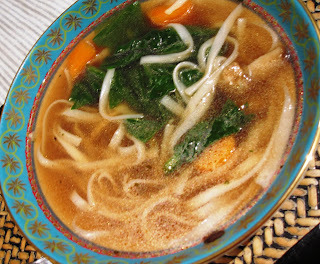 It makes any dish so much better than following a recipe to the T. This noodle soup (adapted from Nigella’s show) is utterly delish, low calorie and tastes simply amazing. Eat it as a starter, or for dinner— but I highly suggest sitting down with this in a large bowl, chopsticks and eating and slurping from the bowl, all at once! True honest humble good food. Cook the noodles according to packet instructions, then drain and rinse with cold water to stop it from cooking further. Divide between serving bowls. Top noodles with a dash of coriander, if using. Meanwhile, bring the stock, sugar, (star anise), ginger/galangal and soy sauce to the boil in a saucepan. Add the vegetables and simmer for five minutes, or until just tender. Watch the mushrooms and carrots for cue. Lastly, drop in the sesame oil, for sheer decadence to this humble dish, and it doesn’t hurt that it smells divine! To serve, pour the vegetable mixture over the noodles in each bowl and make sure to serve with a spoon and fork! Slurrrp! Use whatever ingredients you have on hand- the original recipe called for bean sprouts, shitake, pak choi and sugar snap peas. Be imaginative! Fresh=Fabulous! All age groups will love this recipe. It’s simply EASY and fulfilling. Make sure not to add the veggies and leave them in the stock for a while before serving- boil with veggies right before service, or the vegetables will slowly disintegrate and the soup will be boring and texture-less. Coriander is skippable, I didn’t love it. Maybe the Indian coriander is too overpowering for this soup. 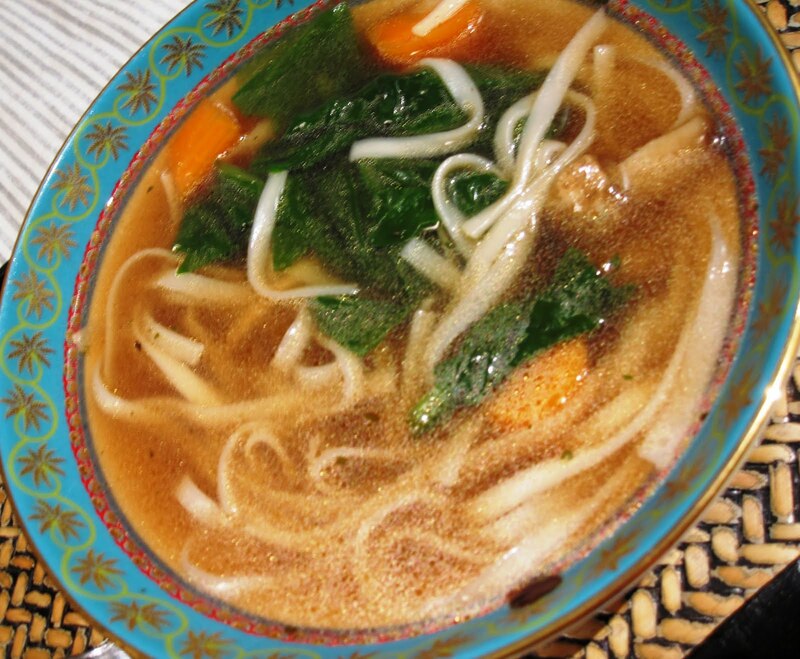 Next time- tofu and pak choi, in miso broth! What say? Goes perfectly with grey clouds!